‘Invicta Cars’ was founded and run by the wealthy businessman, Noel Macklin. He was born in 1886, educated at Eton and in the Great War served as a Captain in the Royal Horse Artillery. He was wounded and invalided out in 1915. He established the Invicta Company in buildings on his estate in Cobham, Surrey in 1925. He had the financial backing of Oliver Lyle of the Tate and Lyle sugar refining dynasty. Invicta produced a range of cars but the marque is best known for its ‘100 mph’ Sports Tourer, the S Type. Macklin’s goal was to produce a car with the quality and reliability of a Rolls-Royce and performance and handling that would better a Bentley. Launched at the London Motor Show in 1930 the S Type was on a par with today’s Supercars. The cost was approximately £ 1,500, a huge amount at that time when the average house price was about £ 200, about £ 1,750,000 in today’s money. The S Type was made of the finest materials available, an immensely strong nickel steel chassis lugged together with massive high quality bronze castings and fitted with a cast aluminium bulkhead and bonnet landings. The car cut a very low profile and to achieve this the chassis legs passed below the rear axle. The S Type was powered by a Meadows 4½ Litre six cylinder engine with twin bronze bodied SU carburettors. In Macklin’s own words “the essential characteristic of the Invicta was luxurious speed” and he was so confident of his product that he offered a Rolls-Royce style three year guarantee. The factory standard offering was the S Type chassis fitted with coachwork by Carbodies of Coventry. The styling was rakishly attractive with broad wings and extensively louvered side valances. The car an impregnable planted look whilst the long bonnet embellished with domed rivets with twin chrome exhausts protruding left no doubt that this was a car with sporting potential. 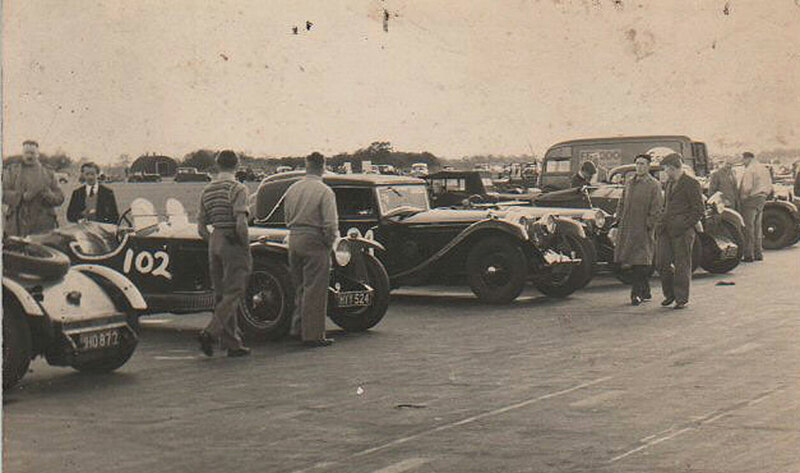 Invicta’s were widely used for racing and rallying, hill climbs and speed trials. In 1931 a young Donald Healey entered the Monte Carlo Rally in an S Type and won. His confidence in the car was such that he returned the following year and was second. In 1932 the lap record for Brooklands and the fastest times at the Shelsley Walsh Hill Climb and the Stelvio Pass Hill Climb were all held by Invicta. There were also numerous victories in International Alpine Trials. There had been a market for high quality luxury sports cars until the Great Depression but in its aftermath they became hard to sell. Invicta cars remained in production until 1934 when the company was wound up. Macklin’s refusal to cut costs, build quality and workmanship ultimately contributed to the company’s demise. During their short production run 77 S Types of various body types were produced and of these only about 30 are thought to be Carbodies Tourers. The car offered is Chassis S 130, ordered from Invicta Cars in 1932 by a Mrs Cohen of Guernsey, the Channel Islands. She specified a Carbodies Sports Tourer and this was fitted with engine number 7733 and gearbox number 5066. The next recorded owner is Mr. D.F. Hicks of Putney, London and there is a reference to 1947 in the history file and this is likely the date he acquired it. Little is known about his time with the car although it appears that he kept it until 1958 and there is evidence that he went racing with the car. There is a picture of the car at a circuit that looks like Silverstone. More research is required but it could be taking part in the National Six Hour Handicap Relay Race that was organised by the 750 Motor Club and a known favourite of the Invicta Car Club. The car is sitting with two other S Types who would have made up the team. What is also apparent is that Hicks had modified the back of the body effectively making it a two seater for lightness. S 130 next appears on the market in 1959, advertised by “Classic Cars”, a dealership based in central London’s Cranley Mews and from this point in the car’s history it is well documented and photographed. In this period it was very common for US buyers to seek out rare cars in the UK and to facilitate this dealers would advertise in ‘Hemmings Motor News’, which fulfilled the same role in the USA as the ‘Exchange and Mart’ over here. The original advert placed by ‘Classic Cars’ is in the history file and the text promises that “Many Rich treasures here await the American Car Enthusiast”. Their description of the Invicta is a work of a highly imaginative mind. Straight out of “School for Scoundrels” it testifies to “One careful owner from new – the late Lord Sykes – brand new unmarked condition, a concours winner” none of which was true. In any event, their advert was spotted by American collector, Mr. William Thill of Dubuque, Iowa. He bought S 130 unseen but then it turned out that ‘Classic Cars’ of Cranley Mews were as ineffective in their after sales as they were inventive in pre-sales. It took a great many letters to get the car prepared, insured, loaded and shipped and this being 1959, the whole episode was conducted by airmail letter. These are all collated in the history file and make for colourful reading. William Thill had actually bought a very good car and clearly loved it as he kept it for 37 years. In his ownership he had it maintained by a local engineer, Frank Schroeder who in turn established contact with Invicta specialist Derek Green, who ran Cedar Classic Cars in Hartley Witney. There was a great deal of correspondence between them during these years of ownership and no doubt this relationship led to Green acquiring the car in 1996 when William Thill died. S 130 was transported back to the UK toward the end of 1996 and retained by Derek Green. It eventually turned up in Cedar Classics advertisements in early 1998 where it was described as a “three owner car in excellent condition”. S 130 next appeared in November 1998 at a Christie’s Auction at the Jack Barclay showroom in London. It was estimated at £ 120,000 – £ 140,000 and the current (4th private) owner bought the car and began a twenty year tenure of enthusiastic ownership. A full restoration was commissioned with the work being undertaken by Rob Pollock’s ‘Downton Vintage’ Lymington based operation. The aim was to return the body to original Carbodies spec and fit an up-rated engine with Phoenix crankshaft, rods and pistons all mounted in a new heavy duty crankcase. The correct look and feel of the car is testimony to Pollock’s excellent craftsmanship and notably the retention of its many original components and bodywork, significantly the original wings, louvered side valences, front apron and bonnet. Unsurprisingly the work took longer than expected and when the car appeared in the 2000 Mille Miglia it was temporarily with fitted lightweight cycle wings and aero screens. 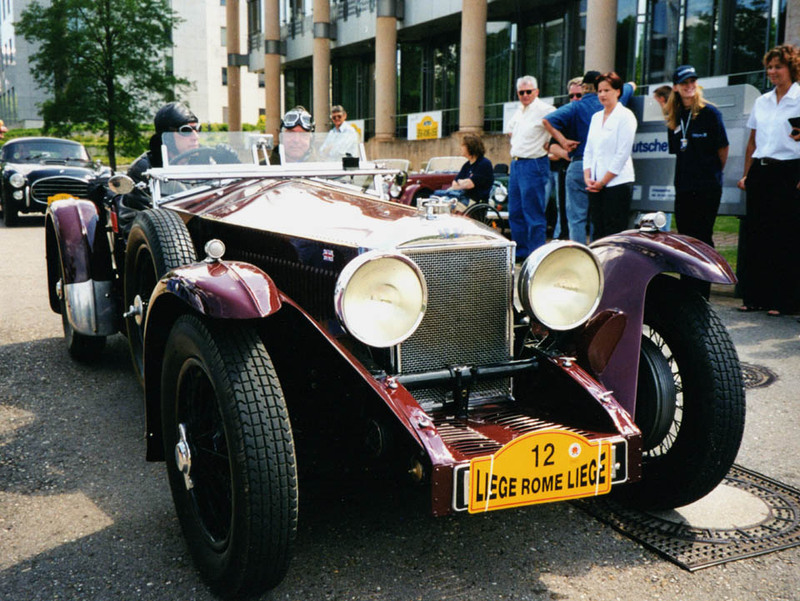 However, the restoration was complete by 2001 as evidenced by photos taken that year on the Liege-Rome-Liege rally. S 130 also took part in the 2002 Klausen Rennen Memorial Hillclimb, the 2005 Silverstone Classic and the 2003 Circuit des Ardennes. Over the years S 130 competed in a multitude of sprints, races and hill climbs and as recently as 2014 was a competitor at the Le Mans Classic. The car is offered for sale with a delightful light patination from a restoration that is nearly twenty years old. It comes with its original engine components including the numbered crankcase. The original gearbox is still fitted. There is also a detachable rear luggage rack for continental touring. An enormous history file comes with it and this comprehensively covers the life of this exceptional and rare car. The car is UK registered and has been issued with a FIVA passport and VSCC Buff form. S 130 has also been featured in several periodicals including Old Motor in 1964 and the 1972 Mayfair Magazine, Volume 7, Number 11. An S Type Invicta is a rare car and S 130 is highly desirable being an original Carbodies Sports Tourer with a high degree of originality, matching numbers and colourful and well documented history.